MANILA, Philippines - PRC Board of Accountancy (BOA) announced the new schedule of May 2018 Certified Public Accountant (CPA) board exams due to Barangay and Sangguniang Kabataan Elections on May 14, 2018. The licensure exam was originally scheduled on May 13, 14 & 20, 2018 but later re-scheduled to take place on May 13, 20 & 21, 2018 at testing centers in Manila, Baguio, Cagayan de Oro, Cebu, Davao, Iloilo, Legazpi and Tacloban pursuant to PRC Resolution 1091 series of 2018. Here is the Resolution No. 1091 series of 2018 courtesy of PRC. Here is the program for May 2018 CPA board exam courtesy of PRC BOA. 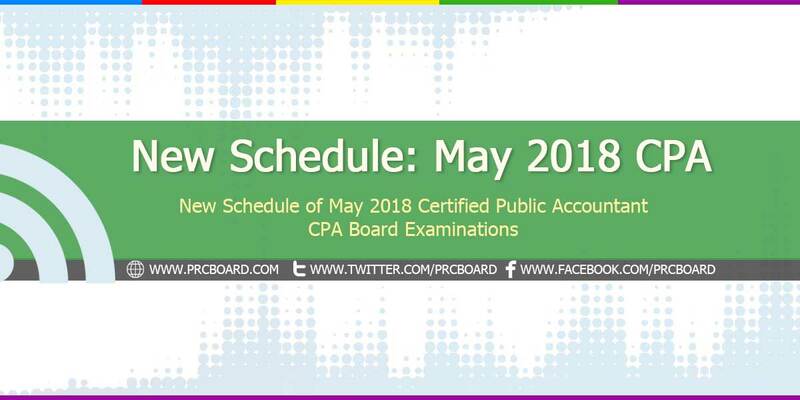 To receive up-to-date news about May 2018 CPA board exam, we advise our visitors to bookmark this page, visit PRC official website or follow us at our social media pages via Facebook and Twitter.